SNAFU! : USAF Academy Football Team wearing F-35A "themed" helmets. USAF Academy Football Team wearing F-35A "themed" helmets. Thanks to Tim for the link! 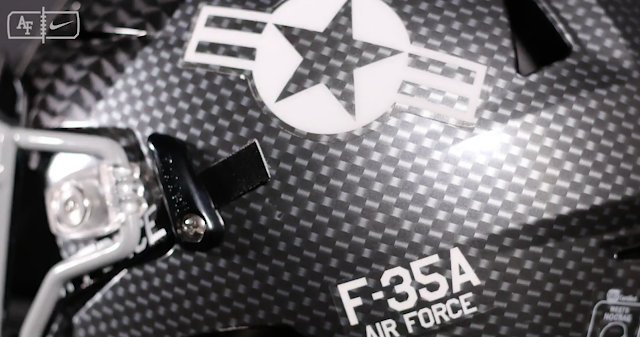 The Falcons will wear special helmets honoring the F-35 fighter jet for a game this season. The pattern on the football helmets is designed to replicate the helmets the pilots of the jets wear. The helmet will have five different designs, the first of which was unveiled today. Follow @AFFootball as the remaining four helmets will be revealed Sept. 5-8. On one side of every helmet will be the familiar Air Force logo often seen on aircraft, which includes the length-wise bars intersecting the roundel. On the other side will be a decal representing one of the five Air Force F-35-A operational fighter squadrons in the Air Force. This is interesting. You would think that if the program is as "rock steady" and "unkillable" as we're being told, then they wouldn't have to resort to this type of weirdness. Considering how the AF Academy is projected to do this year maybe they do need this type of flash to keep morale up.